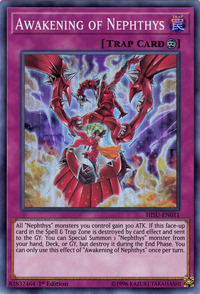 All “Nephthys” monsters you control gain 300 ATK. If this face-up card in the Spell & Trap Zone is destroyed by a card effect and sent to the GY: You can Special Summon 1 “Nephthys” monster from your hand, Deck, or GY, but destroy it during the End Phase. You can only use this effect of “Awakening of Nephthys” once per turn. Disciple of Nephthys and Nephthys, the Sacred Flame appeared in this card's artwork.